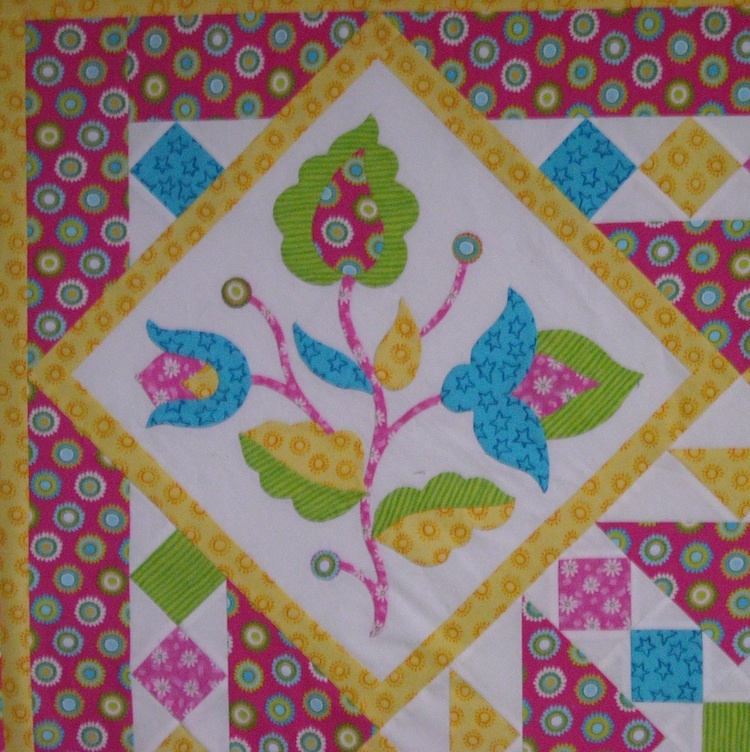 “Bouquets for Hazel” measures 54″ square when finished, and contains some piecing and some applique. Over the course of the next 6 months, beginning next Monday, January 9, I’ll periodically be presenting portions of the quilt. The patterns will be in the form of PDF files that you can download and use to work at your own pace. Here on the daily blog, I’ll be going over the steps contained in the patterns to give you more information and instruction, such as tutorials on how I prepare my applique pieces, or discussions on various methods of applique (so you can choose which one you’d prefer to use on your quilt), or other things related to the making of this quilt as we go along. As always, if you have any questions during the quilt-along, you can contact me and ask. I’ll be more than happy to help you with any issues that arise. I want you to have fun with this. So . . . if you’re ready to do some applique with a little piecing thrown in, and you want to make this quilt top over the next 6 months with us, just keep checking back daily for all the information. I’ll be back tomorrow to discuss fabrics and yardage requirements. So be thinking about what color scheme you’d like to use for your quilt, and before I go . . .
Here’s a close-up shot of one of the applique blocks . . . See you tomorrow! I didn’t participate in the past because I was suffering from plate too full-itis. And I have the many UFOs to show for it! But I’ve made so much progress, some of it with your help!, that I think I can manage a quilt-along with you. The quilt looks just lovely, there is something in there that just calls to me. I look forward to joining you and the others. Such a lovely quilt, Shelly. She and your grandmother would be so proud of you! Oh. My. Holy. Applique! Really? It is beautiful and I said I would do it, so I’m in. I need to learn more about applique anyway. So, perhaps over the course of six months I will learn enough to not be embarrassed. I am still in (but a little worried). I’ve never done appliqué before, only piecing (and mostly squares at that). Do you think it’ll be easy enough that I could learn through this quilt along? Oh Shelly, I’m absolutely in! It’s beautiful! It has a Jacobean flare to it. My mom did many Jacobean designs in crewel work. I always loved them. This calls to me too; just have to do it. I’m so excited! I love the look of this applique project. I would love to make it & want to do it in brights like yours. Those colors are out of my comfort zone & I need to try something like this. I have done a little applique but I still have a lot to learn. It will be fun to do it along with others & see the other fabric choices.